Wolverhampton Show Gallery: Sat 11 & Sun 12 July 2009 and Sat 10 & Sun 11 July 2010 West Park, Wolverhampton. (Click on thumbnailed images to enlarge.) Wolverhampton Show Pics Added! 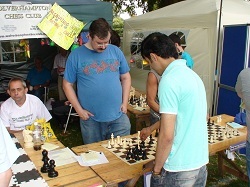 Sun 12 July 2009 Paul Walters makes a move and other games in progress. 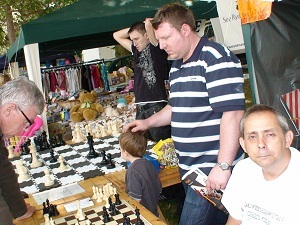 Wolverhampton Show 2010 . . Space for more pics! 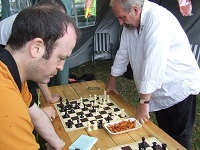 Sat 10 July 2010 Steve Wilson makes his move as Matthew Tudor ponders Sat 10 July 2010 Ray Dolan deep in thought. 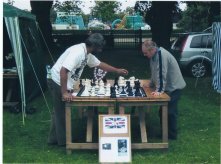 Sat 10 July 2010 Peter Tudor plays with giant chess set Sat 10 July 2010 Gordon Sands and Richard Dawson play speedchess, almost supersonic. Observers watch some wonderful games. 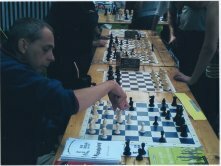 Gordon Sands : nearly a simul against so many brains. 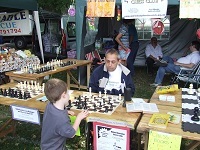 Wolverhampton Show 2010 : Chess in the Park. 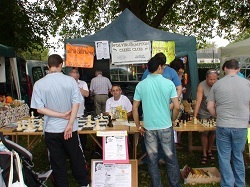 Wolverhampton Chess Club were present at this huge event. Last year was fantastic and this year will was even better. 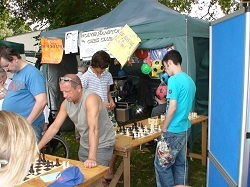 Giant Chess, team chess, prizes if you win on the "Beat the Chess player" board. 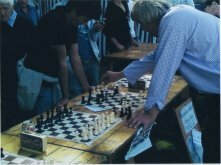 Win free 1 year membership for 4 wins, chess books for sale. Everyone come along, play some friendlies with some of our members. 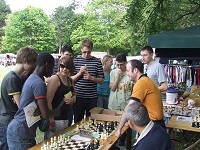 Enjoy the outdoor Chess experience! 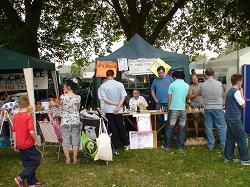 Check out our stall. 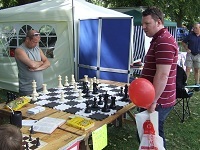 Just want to find out more about Chess? 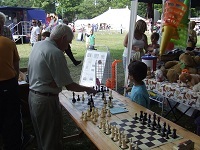 See what our Chess Club is about. 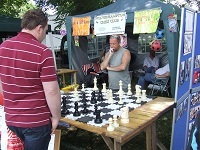 11/07/10 Wolverhampton Show: Chess in the Park. 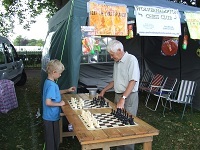 A fantastic weekend of fun and Chess play. 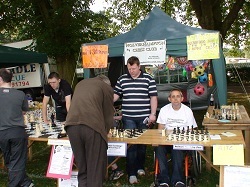 Wolverhampton Chess Club are proud to be a part of our huge and popular City Show. 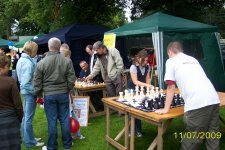 Many of our members and friends turned up during the weekend to help and play Chess with the public and enjoy the outdoor chess experience. Thank you to members R Dawson, G Sands, B Lewis, C Haughton and family,P P Jones, M Townsend, B Khoshnevis, M Steed, S Wilson, M Tudor, P Tudor, D Wightmann, M Wooton. 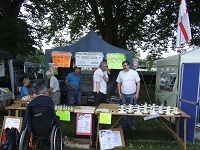 Also thanks to Ray Dolan SCA Publicity Rep and P Broomhall of Rushall. 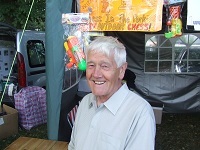 Great to see M Carr of St Mary's too.. 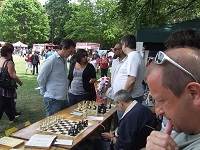 Most of all thank you to the public for turning up to experience Chess in the Park with Wolverhampton Chess Club. 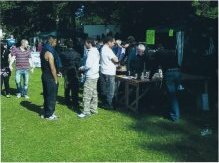 Hope to meet some of you again soon at our club. What a fantastic weekend we all had. 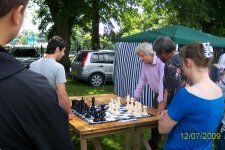 Great fun for all who attended and played friendlies. 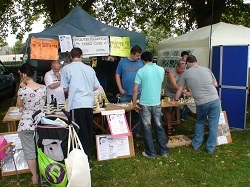 A Great successful event. 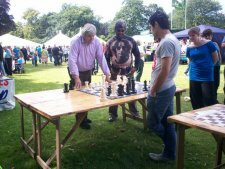 Wonderful to experience outdoor Chess at the Wolverhampton Show and to be a part of this huge event! 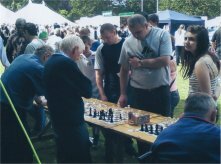 Thank you to all who turned up, helpers, players,the Wolverhampton show wouldn’t have been a success without members and key members such as Barry Lewis, Richard Dawson, Gordon Sands, Paul Walters and Steve Wilson (all subcommittee). 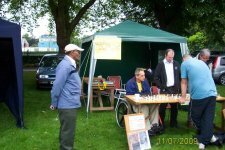 All helped during the weekend as well as Frank Wood, Mike Townsend, Max Wooton, Bob Khoshnevis, Colin Haughton, Mike Steed. 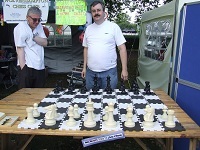 Ray Dolan of SCA did an excellent job on both days supporting us with promotion and playing public. 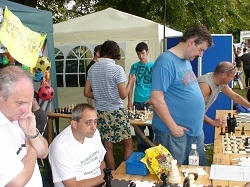 Also Peter Broomhall’s attendance on Sunday much appreciated! 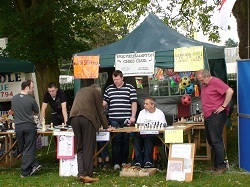 Thank you all and to the many members of the public who played Chess games with us. A great Team effort!!! We hope to see you soon at our club every Thursday evening. 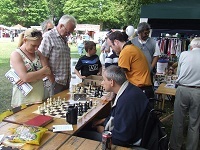 A special email of praise for the event will be available to read on our club noticeboard from Thurs 16/07/09. 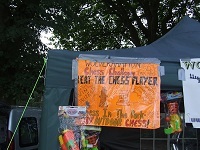 Wolverhampton Chess Club will be present at this huge event from 11pm til 6pm. Admission is Free. Gates open from 11am. 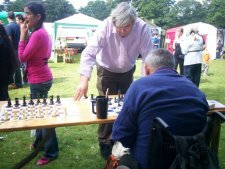 Want to find out more about Chess? 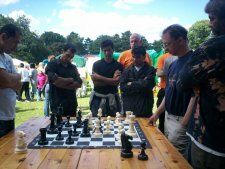 Play some friendlies with some of our members? 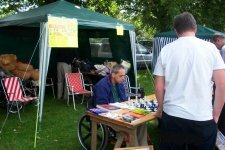 Everyone welcome, come along, check out our stall. 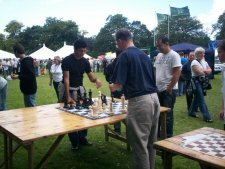 See what our Chess Club is about. 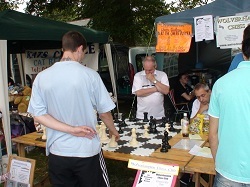 Day 1 of the show was a great day and many of our members played friendlies with public and chatted. A concerted effort from our members and special thanks to Ray Dolan. 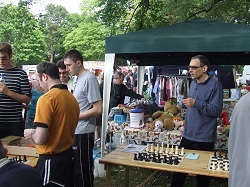 BUT day 2 of the Wolverhampton Show is tomorrow and we'll all be present to try a make the day an enjoyable one. So, everyone come along! 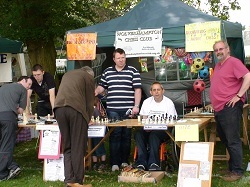 Have a game Chess, experience outdoor chess or find out more about our club. 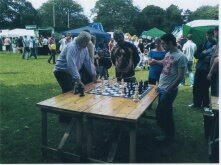 Day 2 we'll have 1 Blitz board, as well as the Giant Chess! 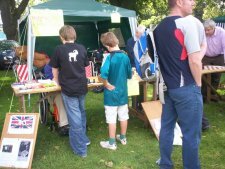 Plenty to see and do at our stall and at the Wolverhampton Show.. Thank you to members R Dawson, G Sands, B Lewis, C Haughton and family,P P Jones, M Townsend, B Khoshnevis, M Steed, S Wilson, M Tudor, P Tudor, D Wightman, M Wooton. 7/10 It's Showtime! The Gazebo's up as of last night! Everyone knows their rota allocations. Yesterday was the hottest day of the year so far and today hotter. 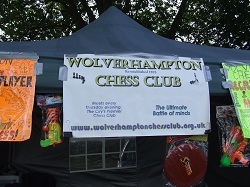 It's 7.46am and soon we'll be setting out to set up Wolverhampton Chess Club stall. 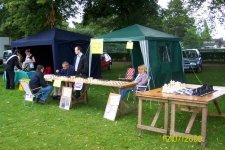 Our pitch in roughly same place as last year. Let's all have a fabulous weekend at our wonderful City Show!